Anyone who has ever read A Little Princess remembers the happy moment when the kind neighbour starts turning Sara Crewe’s cold attic into a cozy haven. She gets back after a day’s hard labour to find warm slippers, a comfy chair, and a hot dinner. Well, JF and I have our own special benefactor: my amazing (generous, funny, smart) aunt JoAnne, a.k.a. the Paint Fairy. The Paint Fairy comes into our house while we’re at work and makes magical things happen. 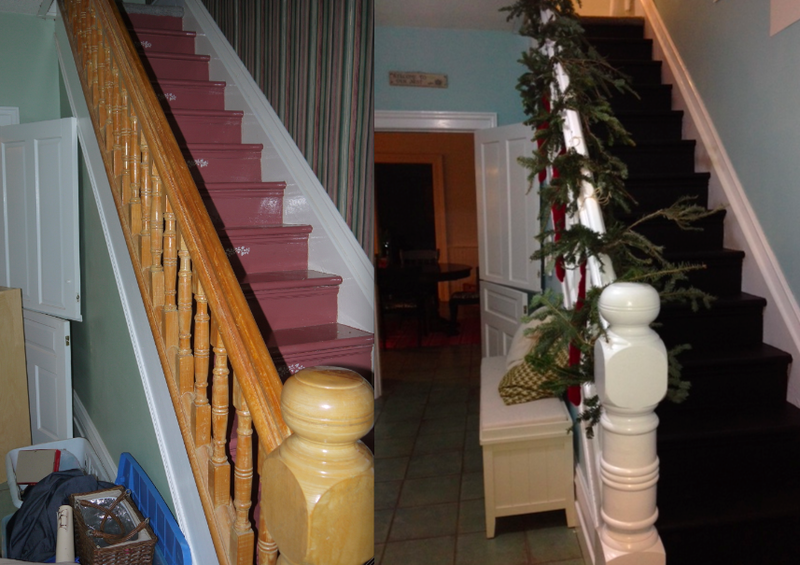 First, she made our ugly purple stairs a more dignified black. Then, she swapped our grimy yellow doors for neutral white ones. Left: Yellow doors, white walls. Right: white doors, white walls. She never drips, does as many coats as it takes, cleans everything up, and leaves nice notes on the kitchen table. She also (I suspect) does far more than she lets on. Something tells me all the trim in the hallway is looking fresher than before, and I’m pretty sure those exposed pipes were a dirty brown. The Paint Fairy’s gifts – time and energy – are infinitely better than money under my pillow or presents under my tree, because they make my too looooong to do list that much shorter. And they instantly put me in a good mood when I get home. Because she won’t let me thank her with money or presents (she’s granted me dinner at our place… pretty sure she’s never sampled my cooking) I want to thank her here. Merci, ma tante, pour ton merveilleux cadeau. Je t’aime. If there were more paint fairies out there, the world would be a happier place. This entry was posted in Decorating, Love, Family and Friends and tagged decor, Fairy tale, Home, house, Little Princess, mudroom, paint, presents, stairwell, Tooth fairy by Mikaela Lefaive. Bookmark the permalink.